* For bathrooms up to 60-110 sq. ft.
For other rooms up to 75-135 sq. ft. 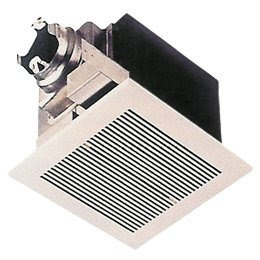 The Panasonic WhisperCeiling bathroom vent fan model features a totally enclosed condenser motor and a large, double suction blower wheel to quietly move air. The blower wheel is also designed to draw air in from both sides, which helps keep the noise down. n fact, it is quiet enough that you might not even know it's on. This fan is designed to give you continuous, trouble-free operation for many years thanks in part to its high-quality components and permanently lubricated motors which wear at a slower pace. The fan housing is made of heavy-gauge zinc galvanized steel and painted to protect it from rust. 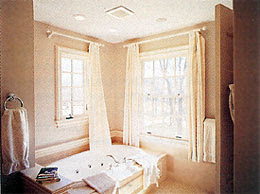 The Energy Star qualified bathroom vents feature super-quiet operation and high CFM-to-Watt efficiency.